Analogic: Takes place on a spacescape overlayed by a grid of seemingly random numbers. It impresses me that the Odyssey, a system that doesn't do math, would be the system to introduce a game with arithmetic as its focus. In addition to being the first math edutainment vehicle, Analogic is also the first Science Fiction-themed home videogame. The Analogic Überlay is a grid of seemingly random numbers superimposed over a simple spacescape. I say "seemingly" because those numbers are actually a maze. (It's important to keep that in mind for later.) Each player controls a PlayerSpot which starts the game at either the planet Even in the upper left, or the planet Odd in the lower right. They represent “light beam transceivers”. The light beam itself is the BallSpot. To setup the game, players bring out the BallSpot and, using their ENGLIGH knobs, maneuver it so that it is constantly bouncing back and forth between the two PlayerSpots. The object of Analogic is for each player to traverse the space between the Odd/Even worlds and reach the other player’s starting position before their opponent does by choosing odd or even numbers on a vertical or horizontal path. Doing so will involve math. The whole point of the game is to force the players to add small numbers aloud and to demonstrate that they understand the difference between an odd and even number. If going first, planet Odd’s player (starting in the lower right) would move to a number matching their planet’s “polarity”, in this case, their only choice would be the “3” just above their starting square, as players are only allowed to move either vertically or horizontally. The player for planet Even, would then have to choose to move to a number which, when added to the number just moved to by their opponent, would add up to a number matching their planet’s polarity. So in the case of player Odd moving first, player Even would have no choice but to move to “5” saying “Three plus five is eight; even!”. Planet Odd’s player would then have to move to a number that added up to an Odd number when added to planet Even’s previous choice. 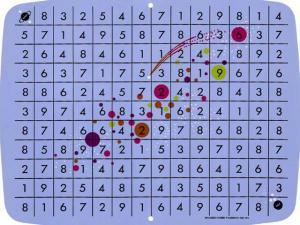 In this case, Odd would move to the grid space labeled “6” and say “Five plus six is eleven; odd!”. There are twists to this seemingly simple exchange. While moving a transceiver, both players must maintain contact with the other transceiver by using their ENGLISH controls to keep the “light beam” (BallSpot) oscillating between the two PlayerSpots. Keep in mind that the player whose PlayerSpot last deflected the BallSpot has control of the BallSpot’s ENGLISH. If the player who has control of the interstellar beam, (i.e. the player who controls the ENGLISH), misses contact with their opponent's PlayerSpot, then that player must go back one space and give his opponent a Diagonal Chip. This chip is good for a diagonal move at “anytime during the game”. After a certain point, however, one can no longer earn a chip because it becomes unnecessary, and then downright impossible, to maintain contact after the two transceivers get within three columns of each other and then pass each other in space. This is where the planetoids come in. If your transceiver comes in contact with a large planetoid, you can earn a chip. After crossing that dotted divide however, there are no more opportunities to earn a Diagonal Chip. This is also where the Sci-Fi backstory becomes largely superfluous, as the PlayerSpots can only deflect the BallSpot from one side, maintaining the interstellar light beam becomes impossible when the PlayerSpots pass each other en route to the other planet. Now, you may be thinking, “Hey, that’s a pretty spiffy, original idea and a great way for dealing with the analog limitations of the Odyssey!”, and you’d be right. What happened when we played, however, was that we often found ourselves in a numerical cul de sac, unable to move forward to a number of the appropriate polarity and unable to move diagonally because we hadn’t received any chips. As an education tool, we though this was due to poor or non-existent playtesting of the playfield. Upon further analysis of the “grid”, however, I realize that Analogic is a maze game as much as it is a math game. Despite there being dead ends, there is a path through the grid for both players, regardless of whether Diagonal Chips are won. I did like the theme and the mechanics. The gameplay, though original in the way it introduced math on a system that can't do math, just wasn't fun enough for my 7 year old son and I to enjoy. Despite being gifted at math, he certainly didn’t like adding numbers under what he perceived of as an environment of “pressure”. ("But there's no pressure in Space!" I explained. He didn't get it.) Our initial experience had first led me to give Analogic no point at all, with extreme prejudice due to misperceived poor design. With recent insights, however, I’m going to change that to half-a-point, without the prejudice. Keep in mind if you ever play it, that Analogic is a maze game, too. By doing, so you may enjoy it more than we did. I too had the brown box as a purely analogue system and the remark about using DTL clears that one up - its innards are digital. This isn't a matter of opinion but of fact. I'm guessing the innards of the machine are a set of gates and the inter-connections are made by traces on each cartridge then? Anyone who has studied computer science and played with truth tables and boolean logic and also built simple circuits will immediately understand that this is a digital device. I'll definitely be modifying the language in the intro in the book once it comes back from editing. I already hedged my bets a bit in there with my description of it due to its unique design, but I most certainly want to avoid any falsehoods or misunderstanding whenever possible. That's been a significant problem with books in our industry and I certainly want this work to be part of a trend away from that. I guess the Magnavox Odyssey can then be considered "minimally digital" in a way, or perhaps "primitively digital"? Or maybe the "bare minimum of a digital design"? Or even "simple digital design" is the best way of putting it? Again, this is to take nothing away from the undeniable accomplishment of creating and having released the first videogame system, it just needs to be differentiated from what came both before (in terms of non-personal computing devices) and after (personal videogame and computer devices). By the way, I put the Magnavox Odyssey in the classification of "Fixed Game Systems", like the later Pong units or today's TV games. While it did use "cartridges", really all these plug in cards did was turn the built-in features on or off. While again, at its most basic, this is what interchangeable game systems do, I don't consider the Odyssey in the "infinitely" reprogrammable category. That's why I relegated the Odyssey to the introduction of the book rather than having its own section like the other videogame and computer systems that do meet that designation, starting in 1976 with the Fairchild Video Entertainment System (VES) and 1977 with the Apple II, Commodore PET and TRS-80 computers. While home videogames began in 1972 with the release of the Odyssey and had its next milestone with Sears releasing Atari's Pong in 1975, the real start was in 1976 by my definition. Same thing with computers. While the MITS Altair 8800 kit was released in 1975, beginning the personal computing revolution (prior to that, users had to track down their own parts to build a system), the first pre-assembled systems weren't released until 1977 (not to mention the sticky fact that the Altair and its clones didn't have a traditional display without significant expansion).